The Asian Indian American community is a highly educated population that has doubled in number in the last decade. With over 80 percent of Asian Indians identified as foreign-born, the population grew from just over 16,000 in 2000 to approximately 33,000 in 2010 (1). Asian Indians primarily immigrated to Minnesota through family reunification and for professional opportunities (2). Due to their highly educated and highly skilled population, Asian Indian Americans also have the highest household income compared to other AAPI ethic groups with an average income of $91,151 per household (1). 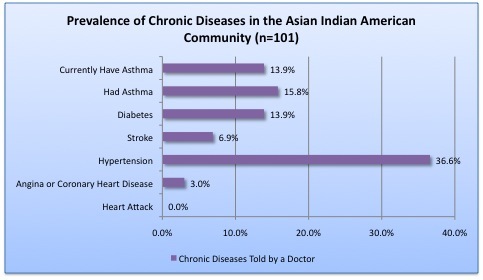 Asian Indian American community members discuss community health issues in the Spring of 2012. In the spring of 2012, APA ComMNet invited Asian Indian American leaders to openly discuss the health issues affecting their community. The discussion was recorded as a radio show and broadcasted on Radio ASIA (106.1 HD Radio). Asian Indian leaders were particularly concerned about the increasing obese and overweight members in their community. 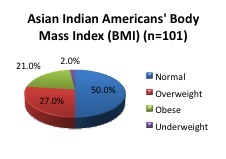 In a recent survey conducted by APA ComMNet with 101 Asian Indian Americans, results show that nearly half was obese or overweight (see figure 1). 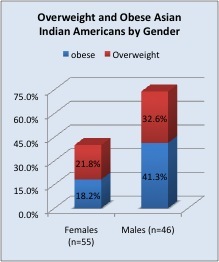 Asian Indian American men were more likely to be obese or overweight compared to Asian Indian women. In fact, of the Asian Indian males surveyed, approximately three out of four, or 75 perecent, were found to be obese or overweight (see figure 2). Radio show guest Punkaj Parikh shared the reason for this growing health problem in his community. “People are overweight, do not exercise and have poor diets. This causes such problems. The environment is cold, thus people do not get to walk outside as much. The people also eat food outside instead of eating at home because they are in a hurry,” said Parikh. Mitesh Trivedi, another radio show guest, recognized the need for community organizations to encourage physical activity among its members. “Yes, people [should] organize community gatherings and walks. They make different activities such as running, walking or bicycling. Other such games include cricket, choho or Kabadi,” said Trivedi. The rise of obesity and overweight may be related to the increasing rate of high blood pressure and stroke within the Asian Indian American community. APA ComMNet Health Survey results indicate that compared to other Asian American/Pacific Islander ethnic groups, Asian Indian Americans had the highest hypertension, also known as high blood pressure, and stroke rates at 36 percent and 7 percent, respectively. In addition, the community has a relatively high asthma rate at 14 percent (See figure 3). Asian Indian men were diagnosed with these diseases at a much higher rate than Asian Indian women. Asian Indian American radio show guests stated that spiritual exercises such as meditation and yoga can help community members feel better and improve their health. “The Gita [Indian religious text] helps educate us too. This is one of the most important assets to our community. Yoga and other such techniques were written years ago and now people around the world are using those techniques,” said Radio show guest Trivedi. Asian Indian community members added that their religious organizations often provide invaluable health education and services to members of the community. “Swami Narayan Temple has bloodmobiles and they also have people that help with general health [called Shibirs]. SV Temple and Hindu Temple has yoga and meditation to help with general health,” added Parikh. Other social and environmental factors such as having a clean environment, good resources for youth and better transportation were identified as factors help Asian Indian Americans maintain their quality of life. This is the second article in a series examining the health and wellbeing of Asian Americans in Minnesota based on the information collected by the Asian Pacific American Community Network (APA ComMNet), a collaboration led by Asian Media Access (AMA), through a grant from the National REACH Coalition (NRC) and the Center for Disease Control (CDC). 1 Council of Asian-Pacific Minnesotans (CAPMN). 2012. The State of Asian Pacific Minnesotans: 2010 Census and 2008-2010 American Community Survey Report. St. Paul, MN. Published by the Council of Asian Pacific Minnesotans.